The crowd at Liberty University Convocation on Friday, including many alumni visiting for Homecoming, served as a loud, enthusiastic studio audience while celebrity political commentator Laura Ingraham aired her nationally syndicated talk radio show live from the Vines Center. Millions tuned in to the broadcast from coast to coast. 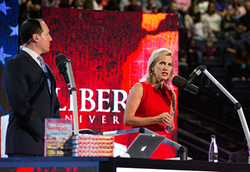 Nationally syndicated radio host Laura Ingraham, joined by best-selling author Raymond Arroyo, hosted her show live from Liberty University on Friday, Oct. 13, 2017. The crowd at Liberty University Convocation on Friday served as a loud, enthusiastic studio audience while celebrity political commentator Laura Ingraham aired her nationally syndicated talk radio show live from the Vines Center, with millions tuning in from coast to coast. Convocation marked the kickoff for Liberty’s annual Homecoming and several alumni joined students in the audience. Liberty President Jerry Falwell welcomed Ingraham to Liberty for the first time since 1982. Back then, she was a freshman at Dartmouth College and visited to interview the late Dr. Jerry Falwell, the university’s founder. The younger Falwell said he found an ally in Ingraham, a rare conservative studying at an Ivy League institution, and the two have remained friends as their careers have developed. Ingraham served with President Ronald Reagan’s administration before going on to law school and, eventually, hosting one of the nation’s most listened to radio programs. She is also a regular guest on FOX News and an author, most recently of “Billionaire at the Barricades,” which she offered to students at a discount. Ingraham stayed after Convocation to interact with students and sign copies of the book. “She is on the front lines every day. What she has done for this country … has just been incredible,” Falwell said. During the live broadcast of her show, which was co-hosted by best-selling author Raymond Arroyo, Ingraham discussed the rise of President Donald Trump (whom both she and Falwell supported), and, specifically, how he has energized working class Americans, who have felt overlooked and taken advantage of for years. Ingraham shared her own background of growing up in a hard-working, middle class Connecticut family to relate to those feelings of being alienated. During her show, Ingraham took time to praise Liberty’s growth, saying, “You’ve come a long way, baby,” and suggesting that she would like to come teach a course on campus. She even reminded her listeners tuning in from California to New York of Liberty’s historic win over Baylor University — Flames Football’s first victory over a Power 5 school — as she announced, “Poor Baylor,” from the stage. Ingraham answered questions from Liberty students live on the air. Students asked the host to share her thoughts on complex political issues ranging from immigration and caring for refugees to how Republicans can diversify their voter demographics. Throughout her show, Ingraham stressed the importance of being civically involved, and of respecting the office of the president while demanding it be accountable to the American people and serve their interests.